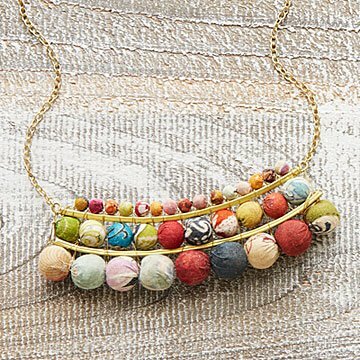 This vibrant bib necklace is handcrafted from Kantha textiles wrapped around wooden beads. Why settle for just a pop of color when you can have the entire rainbow? This vibrant bib necklace is made from wooden beads hand-wrapped in Kantha textiles, a traditional South Asian embroidery technique used to make saris. The beads are arranged in three tiers, arrayed on a framework of brass beams and wires. Because it's their unique prints that make saris beautiful, colors and patterns will vary. Handmade by women artisans in India who receive training, education, and fair wages. Make it a set! Click here to see the matching Kantha Chandeliers Earrings. Everytime I wear this necklace there are positive comments! The Necklace is AMAZING! This horizontal shape is definitely unique and although I prefer longer necklaces the shape is exactly right with that length!And it is perfect! The size is ideal - its quite big to be striking but not huge - so you easily can put on the earrings which come in matched set (need to buy separately) and it won't look like you have too much jewelry on in condition if you wear dark (brown/black/dark or olive green will be perfect as well as boho style in clothing) In general, my impressions about this necklace is just WOW! It is MUCH beautiful in person and its not so bright - the colors are more faded and earthy than in the picture which I love!Its delicate work, its warm and cosy, its handmade!It worth every penny you spent - it is really fantastic necklace! My daughter-in-law will enjoy wearing this fun necklace and I'm sure she will get many complements. I actually haven't worn it yet but plan to wear it with a linen dress that will be perfect with it. Awesome necklace! I have had so many compliments on it. Wonderful artwork in this necklace.